← Music, Color, Costumes and Beads—It’s Mardi Gras Time! Today is Ash Wednesday, the first day of Lent, a time of preparation leading up to Easter observed by Christians around the world. It lasts for approximately six weeks and is marked by self-denial and abstaining from various foods. Meat is traditionally forbidden during this time. 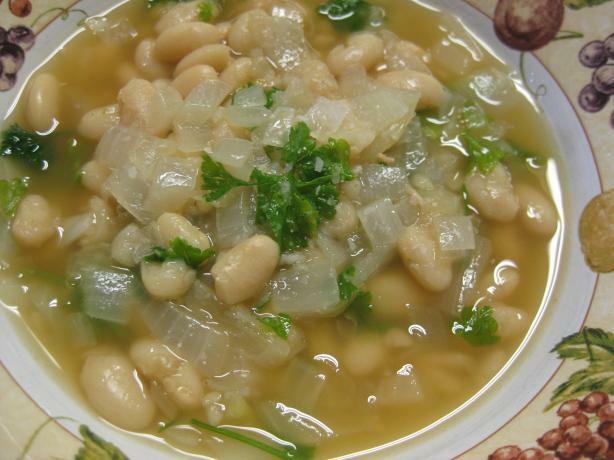 Fasolada, or Greek bean soup, is served during Lent because it is meatless but full of protein and nutrition. While this dish is perfect for the Lenten season, it is often enjoyed year-round and has a rich and ancient history. Fasolada is often called the “national food of the Greeks” and it has sustained them throughout centuries of change. Beans were one of the first crops to be cultivated as human civilization moved from a hunterer/gatherer lifestyle to a more settled existence. For the Greeks, beans became an essential element of their diet. It was discovered that beans were not only a source of food for people, but could also feed livestock. Beans were easy to store, could be used medicinally and actually improved the quality of the soil when rotated with other crops. Legumes were considered so important that Cato recommended farmers present offerings to the gods before a harvest. Bean soup was an easy and nutritious dish to make and could be eaten with or without meat. It was passed down from generation to generation in Greece, surviving through antiquity and into modern times. In fact, throughout history fasolada was often the key to survival. One cook tells of the tales she heard from relatives who described harsh winters when the only meal to be found was a hearty bowl of the bean soup. And when the Nazis occupied Greece and food was in short supply, families survived possible starvation by eating a steady diet of fasolada. While they lacked the oil, olives and many vegetables that make the soup delicious, they cherished the one ingredient that nourished them and kept them alive: the beans. They would make the soup with water and whatever herbs they could gather from the hillside. Today, fasolada is an integral part of the Greek diet during Lent, but also serves as a warm and easy meal during a cold winter. There is an Egyptian version called fasoulia and a Turkish version called fasulye. Although Portuguese and Italian variations use meat in the recipe and are not suitable for Lent, enjoying the soup is still a delicious way to stay warm when the temperature drops. So whether or not you’re observing Lent, this recipe for fasolada is sure to nourish and delight. Soak the beans in water over night. Then boil them with a bay leaf, in water just to cover for 5 minutes. Take the pot off the heat and cover for 1 hour. Pour the beans and bay leaf into the beef broth and slowly boil for 2 hours. Saute the onion in the lard and then add the parsley, the coriander, the salt and pepper. Add this to the beans. Add the honey and allow to boil slowly for a few more minutes. Before serving, add the garlic cloves that have been passed through a garlic press and mixed with the oil. This entry was posted in Blog, Bon Appetit Wednesday, Culinary, Culture, Public Life, Religion and tagged Ancient Greece, ancient history, ancient recipes, AntiquityNOW, Ash Wednesday, beans, Bon Appetit Wednesday, fasolada, Lent. Bookmark the permalink.